Whatever you want for your hen night, London has something for you. The nation’s capital has plenty to offer, from West End shows to award-winning restaurants, and don’t forget some of the best nightclubs and bars the country has too. Here, we’ll take you through the top things to do in London as you celebrate before the big day! Whatever your destination is, hiring a party bus means you can enjoy the journey as well as the destination. Party buses are ideal for hen nights, and can be decorated with balloons, banners and streamers to suit your style and preferences. Party buses also feature champagne on ice, disco lighting, karaoke, plasma televisions, laser lighting systems and more. In a party bus, you can get to your destination on time, and have fun on the way without having to negotiate tube stations or worry about taxis! Kick off your activity packed day by heading to the West End to see some of the world’s most critically acclaimed stage shows. There is truly something for everyone, but we recommend something upbeat and fun to kick off the great night that you have ahead. The West End offers well-known shows such as Wicked, The Book of Mormon and Jersey Boys that will get you singing and dancing away, with tickets starting from £20 per person. If you want something more dramatic, Les Miserables and War Horse are two of the most critically-acclaimed productions on the West End stage, just have your tissues at the ready! If the nightclub scene isn’t for you, seeing one of the world’s best theatre productions will give you a great night to remember. If you want a sophisticated evening with drinks made by some of the world’s best bartenders, look no further than London’s wide selection of cocktail bars. From the new and trendy Cocktail Trading Company in Soho to the quirky Callooh Callay in Shoreditch, there are plenty of fun and different cocktail bars to choose from in the nation’s capital. For a little taste of luxury, you and your friends can head to Radio, which lies in the heart of Covent Garden and features breathtaking views of some of London’s major landmarks. Whatever your scene may be, London has a cocktail bar to suit you and your friends and guarantees a fun night for all. Whatever your taste and budget, London has something to offer you when it comes to your evening meal. Whether you want a fancy but affordable cuisine before you paint the town red, or a luxury, sophisticated dining experience to remember, London has something for you. For fancy restaurants that don’t break the budget, try 10 Greek Street in Soho and Hereford Road, both of which offer mouth-watering dishes at reasonable prices. For a more VIP experience, head to Chiltern House in Marleybone, which TimeOut voted the best restaurant in London and which sells fine and creative contemporary cuisine. Wine and dine in some of London’s finest restaurants for a night you and your friends will be talking about for years to come. One of the best times to see London is at night, and there are a variety of ways you can see the city lights. From the London Eye Day and Night experience, to night sightseeing tours and ghost walks, there is truly something for everyone. The Tower of London also features night time events that would suit those who want to do something a bit different. You can even enjoy a luxury evening dinner cruise along the Thames as you see the city fade into darkness and pass by some of the world’s best known landmarks, such as Big Ben and the Houses of Parliament. One of the most popular activities for hen nights in London is, of course, the wide selection of nightclubs. There are far too many to mention, but if you are interested in a bar crawl around London, it is a great idea to plan a specific route. It is a good idea to plan where you would like to go ahead of time, as some clubs in London have specific dress codes, as well as alternating door closure times and long queues. If you are unsure, your party bus driver may be able to advise you about a good route to take to get the most out of your night. 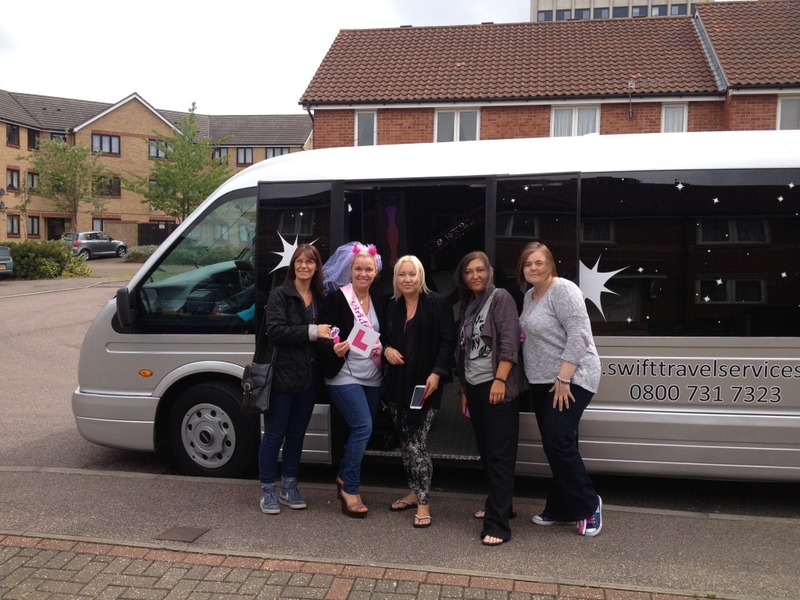 Whatever you choose to do on your hen night, travel in style with a party bus. If you are interested in party bus hire in London, we at Swift Travel can provide you with an excellent service tailored to your needs and preferences. For more information, contact us today by calling 01279 739193.